One of the beauties of photography is that there are so many ways to do it. The numerous styles and techniques allow us to produce a variety of amazing images. Many of these techniques are at best unnecessary and at worst ridiculous. I like these ones. This “Because I Can” blog section is all about these techniques and their value to our photographic experience. Let’s be clear, I do not intend to provide a tutorial. I want to introduce the technique and discuss why such things are good for us. I have discussed how important it is to be the driver of your own photography. The range of photographic techniques available to us, necessary or not, allow us to determine what we do and how we do it. This emphasizes that, for me, the process is more important than the outcome. Of course I want to produce attractive images, but ultimately it is how I spend my time (the process) that makes an activity meaningful. Therefore, when trying something new my goals are (in order of priority) to enjoy myself, understand the principles, apply the technique accurately, and then make an attractive image. 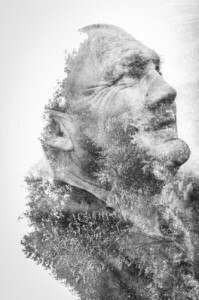 One such technique that I have played with is “Double Exposure”. Double exposure is what it says on the tin. You combine two exposures in to one final image. In the old days this was achieved by exposing the same slide of film twice without advancing the reel. In this method both exposures add to the brightness of the image. Within the digital age this is done either in camera (if your camera has that function) or more commonly in post processing. 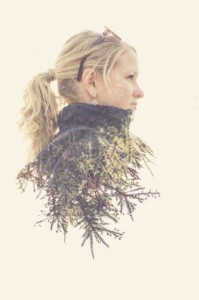 Double exposures often work aesthetically when two contrasting subjects are elegantly combined. For example, a beautiful face could combine either with the hard crisp lines of a city or the rough texture of a forest. The seamless joining of two incongruent subjects makes the viewer question what they are seeing. As noted earlier, I am not interested in providing tutorials – there are plenty out there already. Instead, I want to highlight the principles and your options. Using a digital camera such as Canon 5D mkiii (or a number of Nikons and compact cameras) will allow you to make double exposures in camera. The 5D has variety of ways exposures can be combined as well as an onion skin mode to preview the composition. 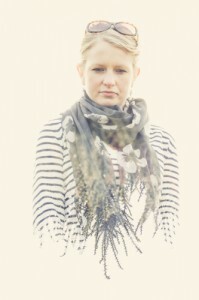 Click here for a good video introducing in camera digital double exposure by Sarah Byrne. As I see it, there are four challenges when making double exposures in camera. First, finding the two separate subjects that will work together. Second, pre-visualising exactly how they fit together within a final composition. Third, calculating (or guessing) the two exposures so that they combine as intended. Finally, you need to execute the shot! Obviously, doing this in post processing makes all these stages much easier – but where is the fun in that?! You can also make in camera double exposures with apps on your iPhone (and I guess android too). I use an app called MultiCamera. I love having this simple tool in my pocket at all times. How does it work in post processing? 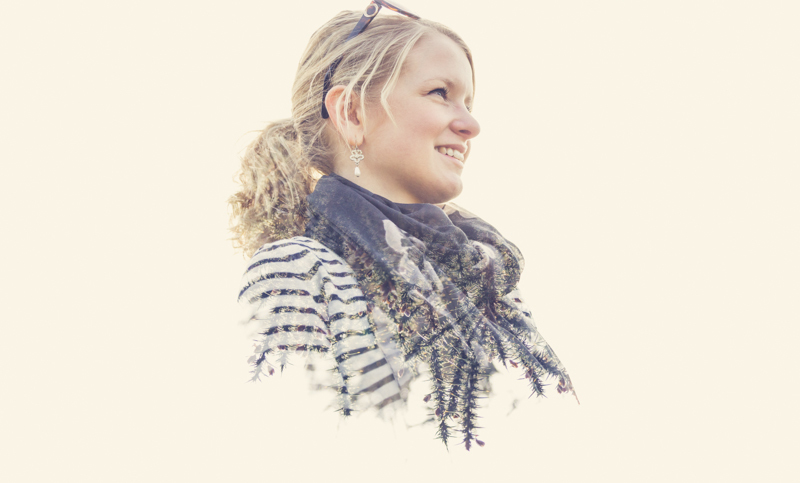 In photoshop (or other editing software) we can simply combine images as separate layers. 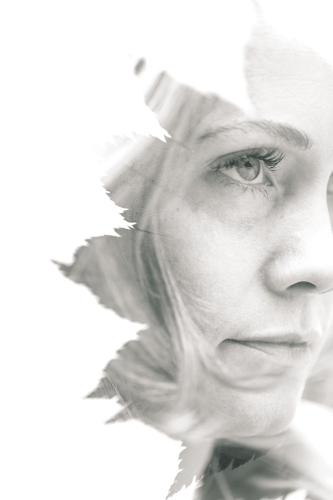 We then use blending options and layer masks to produce the desired results. Tutorials that I have found useful are here by Phlearn and here by DigitalRev. Why do I do double exposures? I do it because it interested me and I can’t think of a good reason not to. Personally I prefer doing it in camera. This is not out of some hipster-purist crap. It is simply that photography for me is about the process of engaging with my camera, people and the outdoors more than my laptop. Regardless of how I achieve it, the main point is that I am doing it. I am choosing what looks fun and doing photography the way I want to. The important bit is that I am driving my own photographic experience. If I see a style or technique I like then I have nothing against trying to replicate it. However, I am not doing things to conform or fit in. I am doing it to learn and tickle my brain. I am not sure that I have made a double exposure I think is really good. I am ok with that because I have enjoyed learning, trying, and being out with my camera and friends.